Homemade gifts are the best! 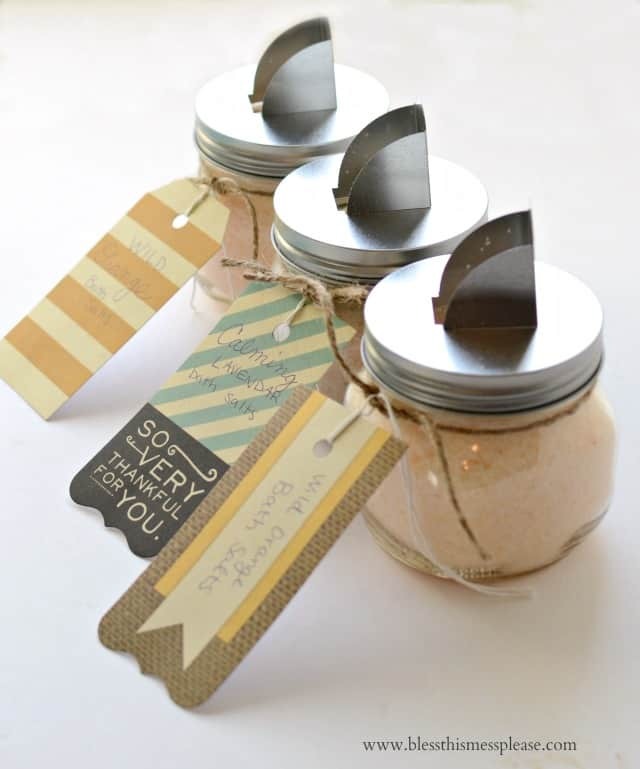 A few years ago I made this fun sewing kit in a jar for teacher and friend gifts and this year I decided on bath salts and sugar scrubs! 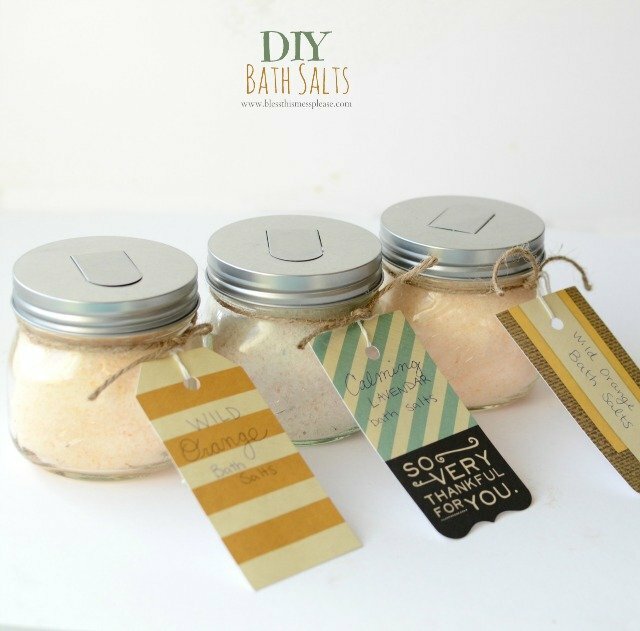 Bath salts and sugar scrubs are great for teachers because they are something they can use, it’s not a plate full of sugar (everyone gets plenty of that), and it’s not a knick-knack they’ll have to dust (and probably have 10 of already). 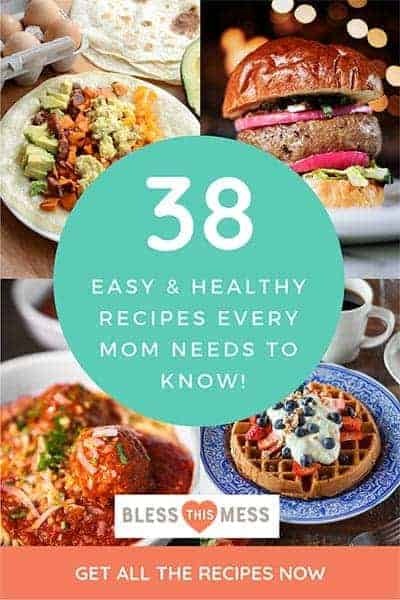 They are great for you because they are really simple to make and take much less time than making a batch of cookies. The key to making these a really special gift is the packaging. I love these jars from Ball as well as these adorable screw on lids with a pour spout. Don’t they look great! 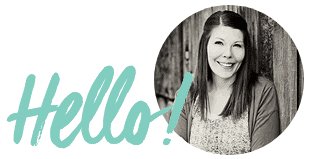 Lucky for you I’m giving away a case of pretty Ball jars today, keep reading! The ingredient you might not know bath salts include is baking soda. Salt can be too strong on it’s own and the baking soda helps to soften it in the water a bit. I used sweet almond oil in mine, but you have a lot of options when it comes to the oil. Coconut oil and olive oil are both easy to find if you can’t find the almond oil. Add everything to a bowl and stir well to combine. Add more oil to reach the consistency that you like. This recipe is very flexible and very easy to make in large batches for gift giving.
. The lids came from Pick Your Plum and I saw them on Amazon once but can’t find them at the moment. To use: Add a few tablespoons of salt to your hot bath while the water is running. Soak for at least 15 minutes.
. I also placed a colored cupcake liner on the lid before I screwed on the ring and that’s what gives it a little color! To use: Soak hands or feet in hot water. 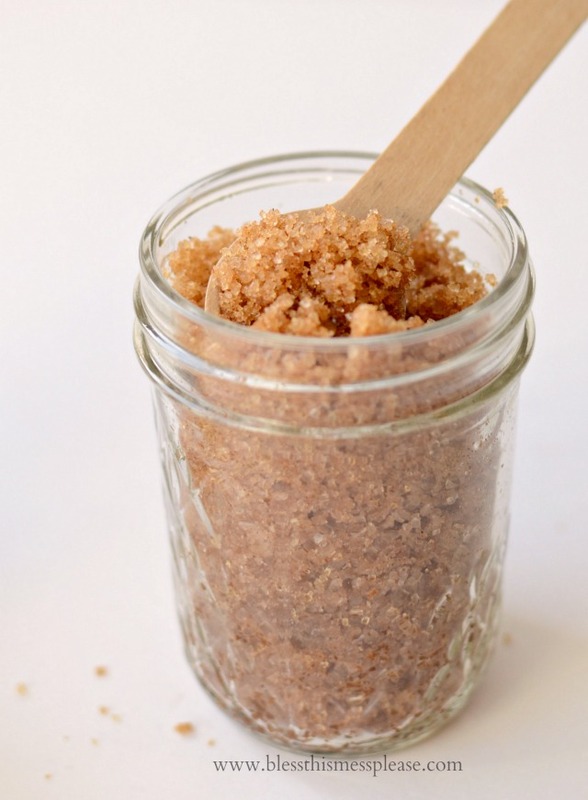 Remover from water and rub all over with sugar scrub. Rinse. Easy beautiful gift-giving at it’s best! I love all things Ball brand. I actually went to Ball State University in Muncie Indiana my freshman year of college . The college was founded by none other than the five Ball brother’s who also started the Ball canning jar company. Ever since then I have been a Ball brand snob and only buy their products. They are excellent! I sent an email to the fine folks at Ball asking if they would give a case of my 2 favorite jars (the pretty Special Elite ones the bath salts are in, in both the 8 ounce and 16 ounce size) and they said yes! So enter here to win some beautiful Ball jars shipped right to your door. Enjoy a few simple gifts and good luck. Thanks so much for stopping in! I always give homemade teacher gifts, but this year I did magazine subscriptions, and got a great deal on amazon! I like to give teachers practical gifts they can use with cute puns to go with them. Teachers can certainly use relaxation, so I like this idea. Whatever we do, I love to make sure we give thank you notes with specific details about what I/my children love about them. Gratitude is everything! It’s the YEAR for body scrubs! I’ve gotten 2 from friends and I’m in LOVE. They’re the best! I love to give handmade gifts to friends and teachers, and there is usually a Ball Jar included 🙂 Happy Holidays! We usually give a hand written card and a baked treat for teachers. I made sugar scrubs this year, plus homemade salted caramels. The caramel recipe is a family secret that gets rave reviews so they’re always fun to hand out and watch reactions! Thank you for the great gift idea and giveaway. 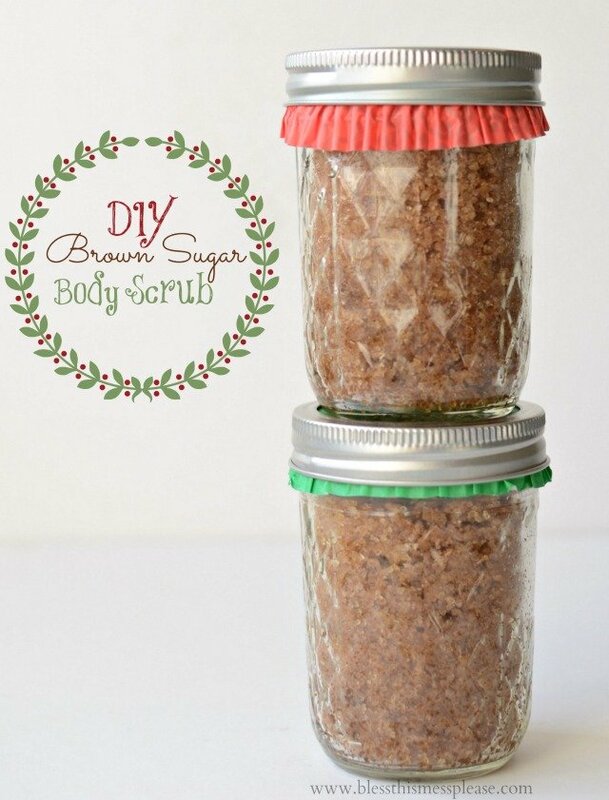 I’ve been looking for a good DIY body scrub recipe and this looks like a winner! I love giving bath and body works lotions! where did you get the lids for those jars? They are from pickyourplum.com , they aren’t available all the time but if you sign up for their email you’ll know when they have them available! 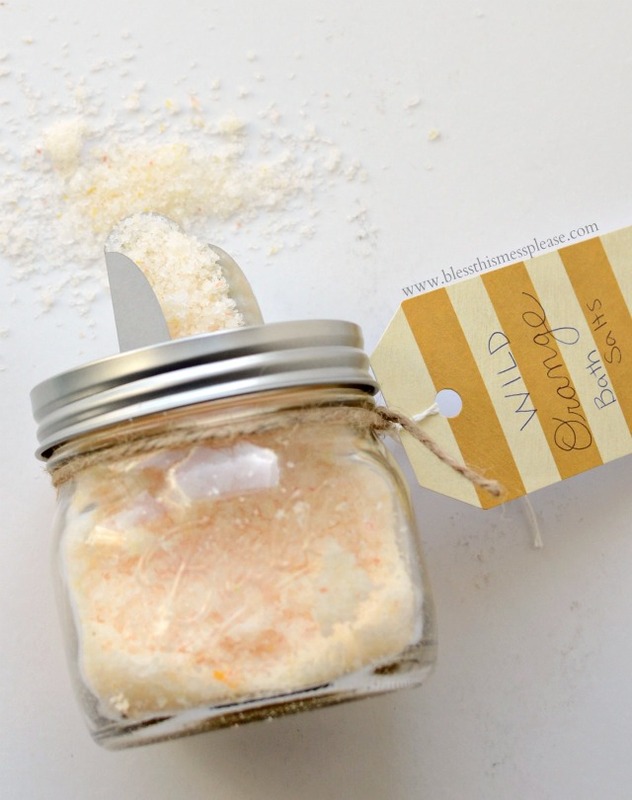 I shipped out 3 jars of these bath salts today…..such a great idea…..thanks!!!! I found the only bottle of soap dye in 3 counties…..dyed half of the salt mixture reddish….then layered into the jars with the white…..super fancy, super fun!!! They looked like a candy cane, but smelled like tangerine……yum!